Dust Race Game - puzzlegames.com - Play fun free puzzle games. 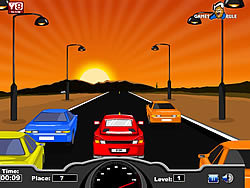 Dust race is a type of driving game developed by games2rule.com In this there are 11 car racers including you. You want win first place in each level to play further levels. In this dust race a dark black is the disturb car, it is not part of the race. Don't hit any car while driving it reduces your speed. Enjoy driving!